Amanda Seyfried gets shrunk to tiny size and joins a race of strange little people as they fight against evil monsters, in the animated fantasy adventure Epic. This film is based on the children's book by William Joyce (Rise of the Guardians), and we've got some lush, fairy-tale-themed concept art from the film, exclusively at io9. 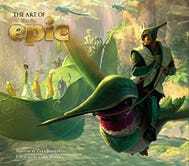 From 20th Century Fox Animation and Blue Sky Studios, the creators ofIce Age and Rio, Epic tells the story of an ongoing battle deep in the forest between the forces of good and the forces of evil. When a teenage girl finds herself magically transported into this secret universe, she must band together with a rag-tag team of fun and whimsical characters in order to save their world — and ours.